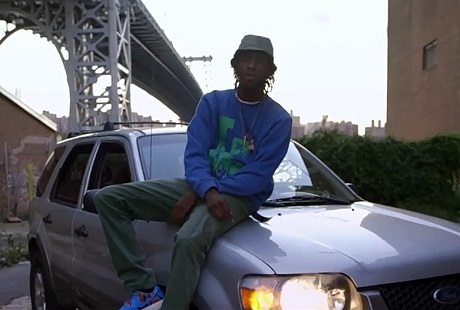 After giving us a glimpse of his solo flow via the Thee Way I See It mixtape, Pro Era member CJ Fly is showing off his Brooklyn surroundings in the joyriding video for "Still the Motto." After hopping into his Ford — not a stolen Jeep — the Beast Coast rapper proceeds to drop bars while driving past landmarks like the Barclays Center and crossing the bridge to pick up his girl. You can see the guy multitask, steering his whip around the city while rapping, and take a timeout to flex his lyrical skills sitting on the hood of his car the video down below.